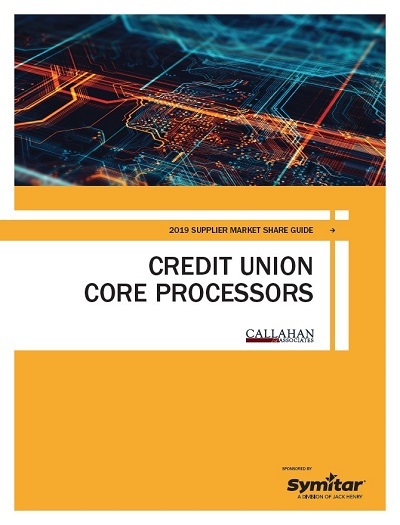 The Supplier Market Share Guide: Credit Union Core Processors by Callahan & Associates offers an in-depth examination of the core processor market every year. Credit unions have many options for a core processor, and choosing the right provider is essential for the stability and security of the institution. This market share guide contains information on the leaders in the core processor space as well as information about the credit unions they serve. The book is designed to help credit union leaders make informed decisions about core systems and IT investments. 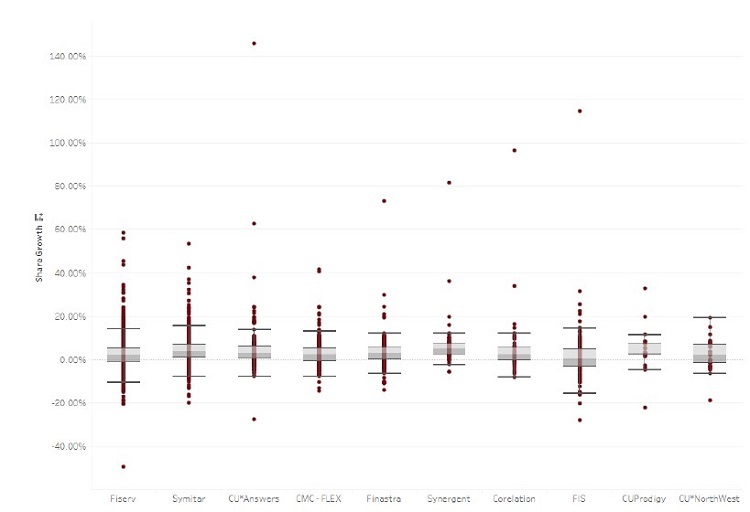 For the most effective analysis, start with the market share tables and graphs. This market data provides an overview of performance from both the provider and platform perspective. The tables also offer core rankings based on number of credit union clients, by credit union membership, and by credit union assets. Platform Profiles provide an aggregate overview of select providers along with minimum, average, and maximum financial performance metrics for credit unions on the respective cores. Fiserv and Symitar remain the largest core providers with a combined market share of 42.9% of the credit union market, supplying core platforms to a total of 2,406 credit unions. This combined market share increased 1 basis point from last year’s 42.8%. Although Fiserv serves 31.7% of the credit union industry on its own, Symitar serves more of the industry’s largest institutions. It has added 10 credit union clients with more than $1 billion in assets in the past 12 months to total 131 in that asset class as of June 30, 2018. Fiserv added seven clients in the same time frame to reach 123 credit unions served in that asset class. Together, Symitar and Fiserv serve 254 of the 305 billion-dollar credit unions, or 83.3% of that market. Symitar maintained its competitive advantage with the larger institutions; however, Fiserv takes the lead across all other asset classes in terms of total number of credit union clients served. As the number of credit unions contracts each year — the number dropped 219 in the past year to 5,596 credit unions as of June 30, 2018 — the number of credit union clients per core provider likewise decreases. Whereas most core providers noted a dip in credit union clients in the past 12 months, there is a notable exception. Corelation added 10 new credit union clients, bringing its total to 63. Although Enhanced Software Products serves only 1.1% of the credit union market, its market share increased 15 basis points year-over-year, giving Corelation momentum for 2019. Symitar Episys added 10 credit union clients in the past year, which bumped up its market share by 63 basis points. With a total of 655 credit union clients, Episys is the most widely used platform in the credit union industry. Three organizations offer Episys: Symitar has 500 credit unions on the platform, Member Driven Technologies has 90, and Synergent has 65. Assets at Episys credit unions have increased 9.4% in the past year. The platform touches $491.1 billion in total combined credit union assets. FedComp serves the second largest number of credit unions. The core provider has 597 credit unions on its platform, 58 fewer than Episys. The aggregate assets that FedComp serves declined by $45.3 million in the past year. The drop in assets is partially the result of FedComp’s continued focus on small credit unions. Share growth for the credit union industry slowed from 8.1% one year ago to 5.4% as of the second quarter of 2018, leaving many credit unions searching for deposit growth strategies to boost liquidity. The accompanying chart identifies the top 10 core providers according to annual share growth of client credit unions, showing the aggregate average and distribution among credit unions with a specific core processor. This guide contains a range of data points that capture the interest of credit union leaders. There are many ways to assess the value of a core processor; this guide provides the necessary information for credit unions to make the most informed core technology decisions.